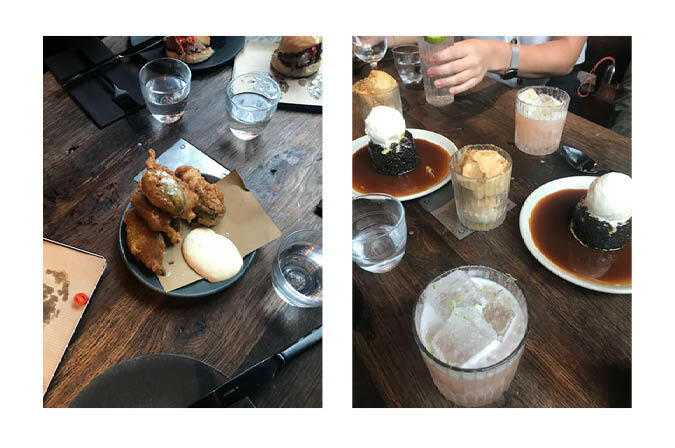 Ahead of a busy summer at a couple of my main sites I took my lovely managers to Smokestak in Shoreditch, East London, for an afternoon of great cocktails and incredible food. The team and I had done our annual Social Supper event the week before which included working with the owner, Dave Carter, as one of the chefs, and having tasted the delicious lamb shoulders he served I was excited for the meal and ready for a meat feast! 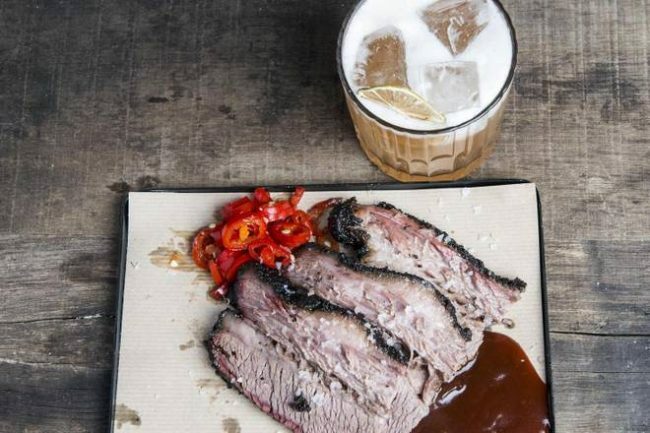 Having studied barbeque in the US, Texas, Dave started Smokestak as a street food vendor making his name with the incredible brisket burgers before setting up shop on Sclater st. 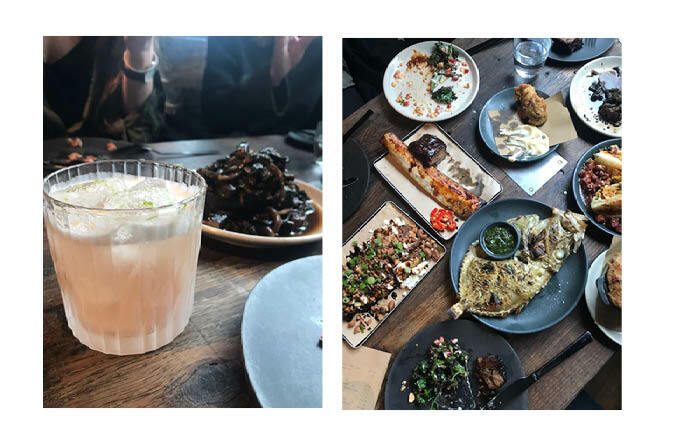 The inside of Smokestak is what you’d expect, woody, smoky and dark with heavy set furniture and black crockery which perfectly sets the scene. The staff, all wearing black, were great, really friendly and they genuinely seemed excited for us to be experiencing the menu. On our waiter’s recommendation we started off with some snacks and Rhubarb Sour cocktails, the sweetness of the cocktail was almost addictive in contrast to the meaty snacks and we enjoyed a good few throughout the meal. 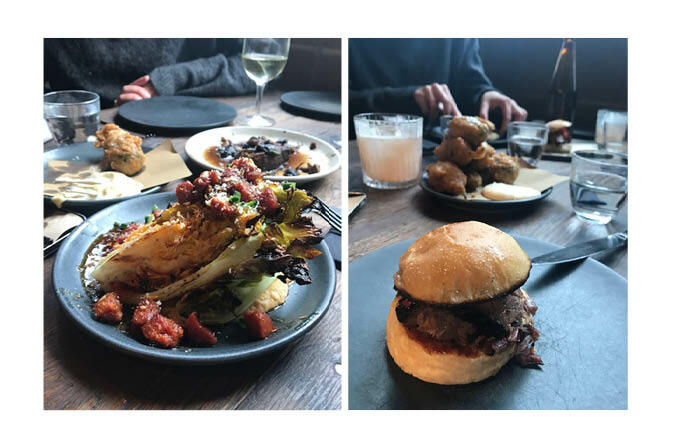 The standout meat dishes for me were the ox cheek croquette and brisket burger however the January king and chorizo side gave them a run for their money whilst the vegetarian dishes also held their own. With a cooking philosophy of ‘low and slow’ the meats were all tender, juicy and literally mouth watering despite being cheaper cuts. I would happily head back with my best vegetarian friends, the coal roasted aubergine had been given the BBQ treatment too, this with the combination of red miso and toasted cashew nuts meant it was one to remember. We were treated to a couple of desserts on the house which perfectly rounded off the meal. I love that the meat doesn’t dominate the experience, the cocktails, wine and desserts are just as memorable making for a spot on afternoon!